Transform data from the long to wide format. Understand which types of figures are suitable to create from raw data. Learn how to avoid common pitfalls when plotting large data sets. pandas enables a wide range of manipulations of the structure of data, including alternating between the long and wide format. The survey data presented here is in a tidy format. To facilitate visual comparisons of the relationships between measurements across variables, it would be beneficial to display this data in the wide format. For example, what is the relationship between mean weights of different species caught at the same plot type? To make facilitate the visualization of the the transformations between wide and tidy data, it is beneficial to create a subset of the data. A long to wide transformation would be suitable to effectively visualize the relationship between the mean body weights of each species within the different plot types used to trap the animals. The first step in creating this table is to compute the mean weight for each species in each plot type. To remove the repeating information for 'species' and 'plot_type', this table can be pivoted into a wide formatted using the pivot() method. The arguments passed to pivot() includes the rows (the index), the columns, and which values should populate the table. Compare how this table is displayed with the table in the previous cell. It is certainly easier to spot differences between the species and plot types in this wide format. Since presenting summary statistics in a wide format is such a common operation, pandas has a dedicated method, pivot_table(), that performs both the data aggregation pivoting. Although pivot_table() is the most convenient way to aggregate and pivot data, pivot() is still useful to reshape a data frame from wide to long without performing aggregation. With the data in a wide format, the pairwise correlations between the columns can be computed using corr(). The columns and rows can be swapped in the call to pivot_table(). This is useful both to present the table differently and to perform computations on a different axis (dimension) of the data frame (this result can also be obtained by calling the transpose() method of subveys_sub). With pivot_table() it is also possible to add the values for all rows and columns, and to change the aggregation function. It is also a common operation to reshape data from the wide to the long format, e.g. when getting the data into the most suitable format for analysis. For this transformation, the melt() method can be used to sweep up a set of columns into one key-value pair. To prepare the data frame, the plot_type index name can be moved to a column name with the reset_index() method. At a minimum, melt() only requires the name of the column that should be kept intact. All remaining columns will have their values in the value column and their name in the variable column (here, our columns already has a name "species", so this will be used automatically instead of "variable"). To be more explicit, all the arguments to melt() can be specified. This way it is also possible to exclude some columns, e.g. the species 'merriami'. Make a wide data frame with year as columns, plot_id as rows, where the values are the number of genera per plot. Hint Remember how nunique() from last lecture. You will also need to reset the index before pivoting. Now take that data frame, and make it long again, so each row is a unique plot_id - year combination. When visualizing data it is important to explore different plotting options and reflect on which one best conveys the information within the data. In the following code cells, as sample data set is used to illustrate some advantages and disadvantages between categorical plot types. This sample data contains three different species of iris flowers and measurements of their sepals and petals. A common visualization when comparing a groups is to create a barplot of the means of each group and plot them next to each other. Another way of visualizing this comparison would be to supplement a measure of central tendency, such as the mean or median, with additional population statistics. This is what can be seen in the boxplot, as described in the previous lecture. A violin plot approximates the distribution of the data through a smoothened histogram. The graphics in the middle of the plot represent a boxplot. Swarm plots draws every single observation and stacks like a histogram. Out of the these plots, which one do you think is the most informative and why? Which is the most true to the underlying data and how would you know this? It is generally advisable to avoid "decorative" plot elements that do not convey extra information about the data, especially when such elements hide the real data. An early champion of this idea was Edward Tufte, who details how to reduce so called non-data ink and many other things in his book The visual display of quantitative information. 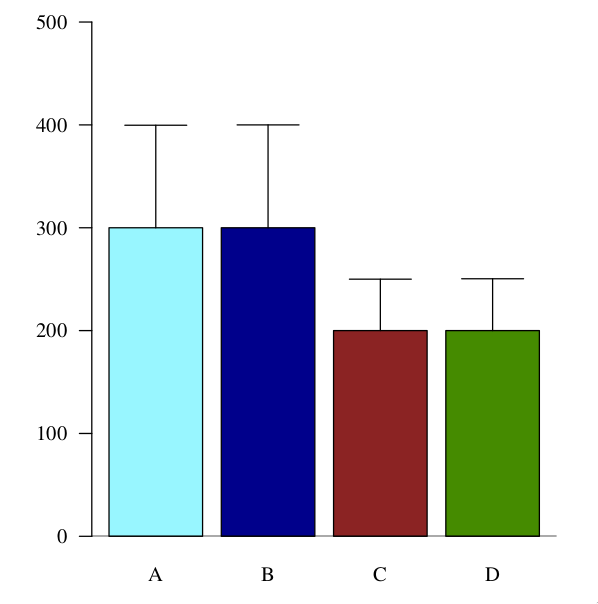 In the bar chart above, the only relevant information is given by the where the rectangles of the bars ends on the y-axis, the rest of it is unnecessary. Instead of using the rectangle's height, a simpler marker (circle, square, etc) could have been used to indicate the height on the y-axis. Note that the body of the rectangle is not representative for where the data lies, there are probably no data points close to 0, and several above the rectangle. 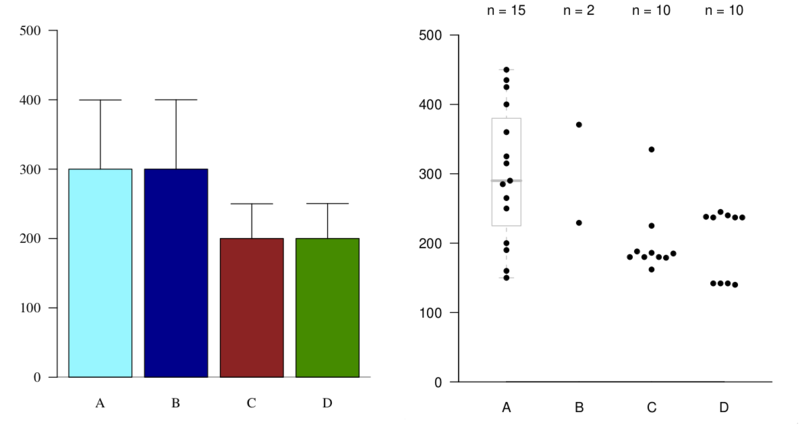 Immediately, you can see that conclusions drawn from the barplot, such that A and B have the same outcome, are factually incorrect. The distribution in D is bimodal, so representing that with a mean would be like observing black and white birds and conclude that the average bird color is grey, it's nonsensical. If we would have planned our follow up experiments based on the barplot alone, we would have been setting ourselves up for failure! Always be sceptical when you see a barplot in a published paper, and think of how the underlying distribution might look (note that barplots are more acceptable when used to represents counts, proportion or percentages, where there is only one data point per group in the data set). Boxplots and violin plots are more meaningful data summaries as they represent more than just two distribution parameters (such as mean +/- sd). However, these can still be misleading and it is often the most appropriate to show each individual observation with a dot/hive/swarm plot, possibly combined with a superimposed summary plot or a marker for the mean or median if this additional information is useful. One exception, when it is not advisable to show all data points, is when the data set is gigantic and plotting each individual observation would oversaturate the chart. In that case, plot summary statistics or a 2D histogram (more on this later). Here is an example of how a violinplot can be combined together with the individual observations in seaborn. So far, we've looked at the distribution of sepal length within species. Try making a new plot to explore the distribution of another variable within each species. Combine a stripplot() with a boxplot(). Set the jitter parameter to distribute the dots so that they are not all on one line. The knowledge of how to make an appealing and informative visualization can be put into practice by working directly with matplotlib, and styling different elements of the plot. The high-level figures created by seaborn can also be configured via the matplotlib parameters, so learning more about them will be very useful. As demonstrated previously with seaborn.FacetGrid, one way of creating a line plot in matplotlib is by using plt.plot(). To facilitate the understanding of these concepts, the initial examples will not include data frames, but instead have simple lists holding just a few data points. This is how a line plot can be created with matplotlib. However, this way of plotting is not very explicit, since some things happen under the hood that we can't control, e.g. a figure is automatically created and it is assumed that the plot should go into the currently active region of this figure. This gives little control over exactly where to place the plots within a figure and how to make modifications the plot after creating it, e.g. adding a title or label the axis. For these operations, it is easier to use the object oriented plotting interface, where an empty figure and is created initially. This figure and its axes are assigned to variable names which are then explicitly used for plotting. In mmatplotlib, an axes refers to what you would often call a subplot colloquially and it is named "axes" because it consists of an x-axis and a y-axis by default. By default an empty figure is created. Plots can then be added to the axes of the figure. To create a scatter plot, use ax.scatter() instead of ax.plot(). Plots can also be combined together in the same axes. The line style and marker color can be changed to facilitate viewing the elements in th combined plot. And plot elements can be resized. It is common to modify the plot after creating it, e.g. adding a title or label the axis. The scatter and line plot can easily be separated into two subplots within the same figure. Instead of assigning a single returned axes to ax, the two returned axes objects are assigned to ax1 and ax2 respectively. To prevent plot elements, such as the axis ticklabels from overlapping, tight_layout() method can be used. The figure size can easily be controlled when it is created. Putting it all together to separate the line and scatter plot. There are a plethora of colors available to use in matplotlib. Change the color of the line and the dots in the figure using your favorite color from this list. Use the documentation to also change the styling of the line in the line plot and the type of marker used in the scatter plot (you might need an online search also). Figures can be saved by calling the savefig() method and specifying the name of file to create. The resolution of the figure can be controlled by the dpi parameter. A PDF-file can be saved by changing the extension in the specified file name. Since PDF is a vector file format, there is not need to specify the resolution. This concludes the customization section. The concepts taught here will be applied in the next section on how to choose a suitable plot type for data sets with many observations. Summary plots (especially bar plots) were previously mentioned to potentially be misleading, and it is often most appropriate to show every individual observation with a dot plot or the like, perhaps combined with summary markers where appropriate. But, what if the data set is too big to visualize every single observations? In large data sets, it is often the case that plotting each individual observation would oversaturate the chart. When plotting a data frame, matplotlib is aware of the structure of the data by specifying the data parameter and the x and y parameters can then be specified just by passing the name of a column in the data frame as a string. Because this is a dataset with 53940 observations, visualizing it in two dimensions creates a graph that is incredibly oversaturated. Oversaturated graphs make it far more difficult to glean information from the visualization. Maybe adjusting the size of each observation could help? That's a bit better. Reducing the transparency might help further. This is much clearer than initially, but does still not reveal the full structure of the underlying data. Before proceeding, add axis labels and remove the axis lines (spines) on the top and the right. The axis can be adjusted to zoom in on the denser areas in the plot. The result is still not satisfactory, which illustrates that the scatter plot is simply not a good choice with huge data sets. A more suitable plot type for this data, is a so called hexbin plot, which essentially is a two dimensional histogram, where the color of each hexagonal bin represents the amount of observations in that bin (analogous to the height in a one dimnesional histogram). This looks ugly because the bins with zero observations are still colored. This can be avoided by setting the minimum count of observations to color a bin. The distribution of the data is not more akin to that of the scatter plot. To know what the different colors represent, a colorbar needs to be added to this plot. The space for the colorbar will be taken from a plot in the current figure. Notice that the overall figure is the same size, and the axes that contains the hexbin plot shrank to make room for the colorbar. To remind ourselves what is plotted, axis labels can be added like previously. It is now clear that the yellow area represents over 2000 observations! Although this hext plot is a great way of visualizing the distributions, it can also be good to look at the histograms. Since this is a common operation, seaborn has a built-in function to create a hexbin with histograms on the marginal axes. This can be customized to appear like the previous hexbin plots. Since joinplot() deals with both the hexbin and the histogram, the parameter names must be separated so that it is clear which plot they are referring to. This is done by passing them as dictionaries to the joint_kws and marginal_kws parameters ("kws" stands for "keywords"). Don't use jet rainbow-coloured heatmaps. Jet colourmaps are often the default heatmap used in many visualization packages (you've probably seen them before). Colour blind viewers are going to have a difficult time distinguishing the meaning of this heat map if some of the colours blend together. The jet colormap should be avoided for other reasons, including that the sharp transitions between colors introduces visual threshold levels that do not represent the underlying continuous data. Another issue is luminance, or brightness. For example, your eye is drawn to the yellow and cyan regions, because the luminance is higher. This can have the unfortunate effect of highlighting features in your data that don't actually exist, misleading your viewers! It also means that your graph is not going to translate well to greyscale in publication format. More details about jet can be found in this blog post and this series of posts. In general, when presenting continuous data, a perceptually uniform colormap is often the most suitable choice. This type of colormap ensures that equal steps in data are perceived as equal steps in color space. The human brain perceives changes in lightness as changes in the data much better than, for example, changes in hue. Therefore, colormaps which have monotonically increasing lightness through the colormap will be better interpreted by the viewer. 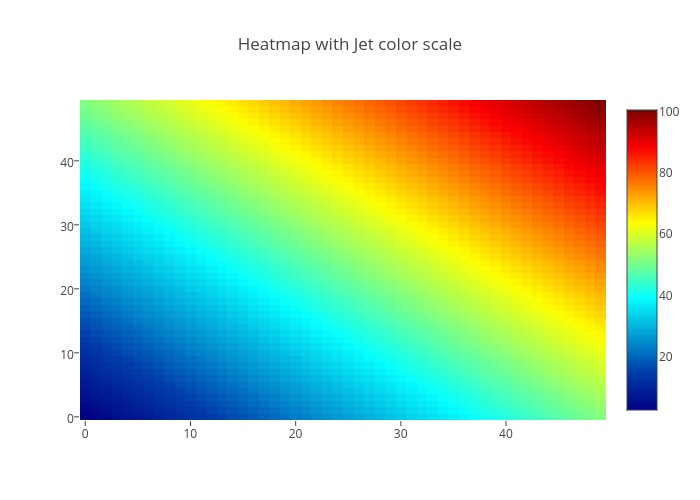 More details and examples of such colormaps are available in the matplotlib documentation, and many of the core design principles are outlined in this entertaining talk. Another approach is to use both colours and symbols. For more resources, here is a great usability article for designing for people with colour blindness.